Reading the comments from yesterday, I learned that our vast readership is hungry for two things: An earlier posting time for our reviews; and more stories about our European travels! With that in mind, I am beginning today's review, at 3:45am, EDT, with a quick story from yesterday. Mme. Lafitte drawing a sample from the '72. Before we came to France, I had done some research and tried to find addresses for a couple of the most famous producers of Armagnac - the ones that all the best restaurants in Paris serve, and that are almost impossible to find in the U.S. We entered one of the addresses into the GPS in our rental CAR (it talks in French, and we have named her "Dominique"), and the seemingly AIMLESS directions took us down tiny little roads through deep woods and then into the very middle of rolling vineyards, eventually announcing that we had reached our destination as we looked upon a nondescript farm building with no signage whatsoever. We sat in the car for a minute or two, cursing Dominique and wondering what we should do, when suddenly another car pulled up. Two young men got out, and then a woman I recognized from an article I had read. She came over to ask what a TOURIST such as I was doing there, and if I needed help. When I told her (in French, Mr. Haight!) that we were trying to find a certain kind of Armagnac (knowing full well who she was), she said "C'est moi," (It's me). I asked whether there were somewhere I might be able to buy a bottle, and she said that the store was at her house and that she was, obviously, not there at the moment, but she was about to give a tour to a buyer from a Paris, so if we didn't mind tagging along ("mind?!" EGADS! ), we could go back and do the purchasing later. So... Frannie and I were given a tour that eventually ended at SHANGRILA, the keg warehouse, where the owner proceeded to ALLOT samples from about ten different vintages, going all the way back to 1968. Fifty years in oak! I was LOATH to leave that room! Frannie decided that her favorite was the 1972, with 1985 being a close second. These two weren't quite as sweet as Cream SODA, but just as smooth. The '72 was over 500€. We OPTed for the '85, and PAID cash for a bottle. I like the theme of broken up names for roads, and the revealer - ROADBLOCK is perfect. As a photographer, I am a little bothered by FLASHLAMP - a term I have never used nor heard used - but overall, the fill was pretty clean. I think ELKIN/ILYA cross is pretty tough for a Tuesday, and I feel lucky to have guessed the L correctly. Not quite as lucky as I felt yesterday, but every day can't be Christmas. Today is, however, a big holiday here, and we'll be lucky to find a boulangerie that's open, so we'd better get out there and start looking! Yeah. I don't even know what to say after that. Um, nice puzzle? That was a fun writeup! Of course it was a holiday; it was my birthday! Good theme, and I agree about the ELKIN/ILYA cross. OFNOTE for me is the use of STRINGTIE (usually seen as "bolo") and the fact that I, too, never heard of a FLASHLAMP, trying FLASHbulb first. 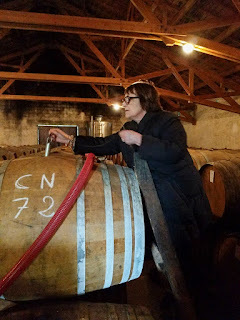 Excellent write-up on the Armagnac experience! Indeed, a more entertaining review than the puzzle itself.